What is Two-Phase Treatment and why would I consider it for my child? Early treatment (Phase I) in our office is an option available to address orthodontic problems before all permanent teeth have erupted. Early treatment is not recommended for all children. It is, however, recommended for those cases we feel will obtain a better long term result if a short treatment phase is initiated early when growth is occurring. Corrections we would consider addressing early include creating space for eruption of all permanent teeth and correcting discrepancies in jaw sizes. Children who have had an early stage of treatment will usually need to wear braces again once all permanent teeth have erupted; this second phase will be shorter and easier than if no early treatment had been done. 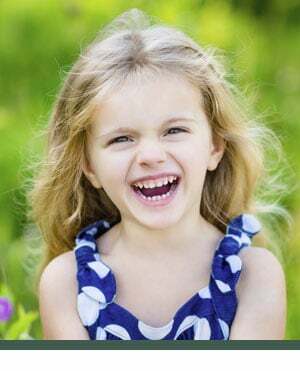 The front teeth are aligned early and the child has the benefit of a beautiful smile earlier. Most children are more interested in their appliances, brushing their teeth and the care of braces than teenagers. Good patient cooperation allows treatment to progress faster and allows the best treatment results. Corrections obtained in Phase I may sometimes be so successful that Phase II treatment is optional or not necessary at all. Total overall treatment fees are not significantly higher if Phase I and Phase II treatment are done than if treatment is delayed until all permanent teeth are erupted. The disadvantage of waiting for complete eruption of permanent teeth and having only one phase of treatment for someone with a jaw discrepancy is facing the possibility of a compromised result that may not be as stable. Phase I treatment may prevent later removal of permanent teeth to correct overcrowding and/or surgical procedures to align the upper and lower jaws. Leaving such a condition untreated until all permanent teeth erupt could result in a jaw discrepancy too severe to achieve an ideal result with braces. What happens after Phase I? After braces are removed, the remaining permanent teeth are allowed to erupt while patients wear retainers at night to maintain corrections. A successful first phase will have created more room for teeth to find an eruption path. Otherwise, they may become impacted or severely displaced. Patients are monitored once or twice each year during this period and re-evaluated when all permanent teeth are erupting to determine if and when a second Phase of treatment will be recommended. The goal of the second phase is to make sure each tooth has an exact location in the mouth where it is in harmony with the lips, cheeks, tongue, and other teeth (the bite). When this equilibrium is established, the teeth will function together properly. Retainers after this phase will be worn at night to maintain your results.